Earlier this year, Admescope announced the acquisition of MetaSafe, a Swedish CRO focused on clinical phase drug safety metabolism studies. After intergration process, we all now work under the Admescope brand, offering more specialised drug safety metabolism services, most namely MIST analysis, to all our customers. 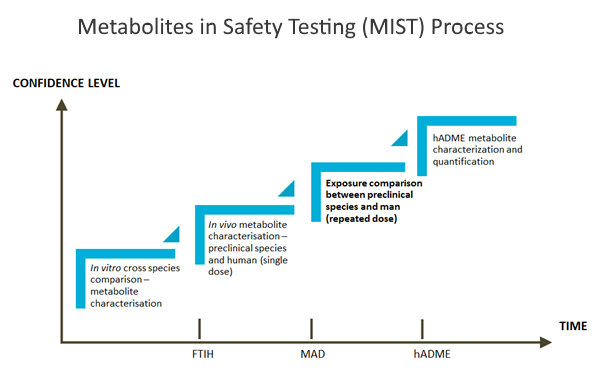 The MIST (metabolites in safety testing) analysis confirms if adequate exposures to human metabolites are observed in preclinical safety species according to FDA and EMA/ICH guidelines. Evaluation of potential MIST issues covers various studies from in vitro cross-species comparison of major metabolic pathways and exploratory in vivo animal experiments to the analysis of samples from first in man clinical study and radiolabeled human ADME study. For more information, check out our safety metabolism services website or contact us at info@admescope.com.